[Update – April 17, 2017] The mayor of Cedar City, Utah responds to call to action against the dog meat trade. We have received a response from Mayor Maile Wilson, in Cedar City, Utah regarding our campaign, asking them to take action over the dog-meat trade in their Sister City, Gapyeong in South Korea and we are pleased to say that she has responded positively. We are grateful to the Mayor for responding to our concern so quickly and for taking action to contact the Gapyeong government. Click HERE to learn more. Mayor Maile Wilson of Cedar City: Tell Sister City, Gapyeong, South Korea, That We’re Opposed to the Torture and Consumption of Dogs and Cats. Gapyeong became Sister city with Cedar City in 2009. In Gapyeong, there are countless dog farms, slaughterhouses, markets and restaurants where the dogs, who are tortured their entire lives, end up being slaughtered in the most inhumane ways, such as by electrocution, hanging or beating; and then thrown into boiling water – sometimes while they are still alive. In many places, dogs are being killed in full view of other terrified, caged dogs. In addition, many abandoned and stolen former pets end up in this industry, and are subjected to the same cruelty. 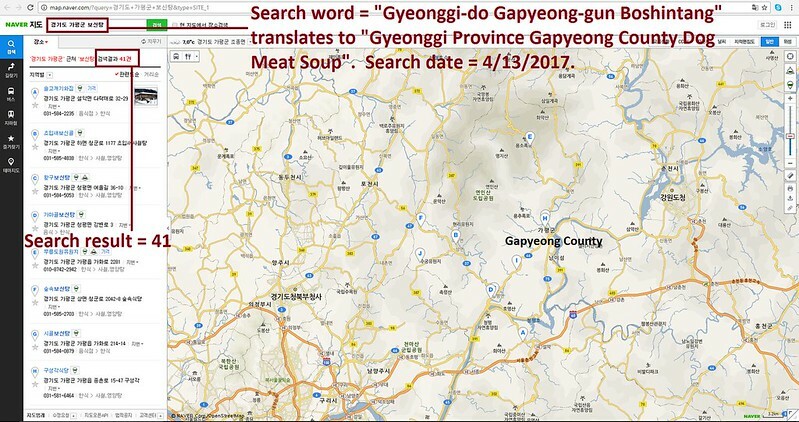 A Search Engine reveals the sickening scale of Gapyeong’s dog meat demand. 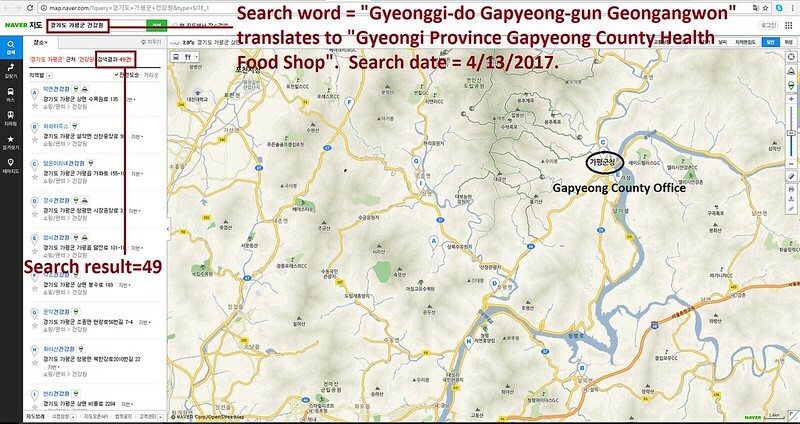 The searches resulted in: 49 Health Food Shops; and 41 restaurants in and around Gapyeong. Even if half of these ‘Health’ Food Shops and restaurants serve dog and cat ‘ingredients’ in one form or another, just imagine how many dog/cat slaughterhouses must be present in and around Gapyeong in order to supply all of these outlets. Please sign petition, call, write and email the Cedar City Mayor TODAY! Send Email: Mayor has responded positively so there’s no need to send emails. Hello, I’m calling to speak to someone in the Mayor’s Office to ask for their help on an important issue regarding your sister city, Gapyeong in South Korea. So, I am asking you to please speak with your counterparts in Gapyeong to urge them to enforce their own laws, not ignore them, and to show compassion to their companion animals, and also respect to their own citizens, by bringing these trades to an end. No matter where you live PLEASE SHARE these actions with your friends – especially those who live in Cedar City! I have received your email, full of history, full of indifference and malice! I was able to search, but I did not find an ounce of compassion !!! So, I will talk to you about our modern world !! our world of 2017 and not of 1950 !! Our modern world where men think to go on the planet Mars !! A world in which South Korea is the economic power. I am going to talk to you about this country and these citizens (some) who excel in the torture inflicted on dogs and cats !! I will talk to you about this modern country, where there are meat dog farms !!! The places where these poor animals suffer a martyrdom from birth to death !!! Where torture rises in crescendo from birth to death !! Where one can think that death represents a deliverance but this is not the case unfortunately ! Some Korean citizens invent diabolical tortures they inflict on these poor creatures of God !!! I will talk to you about this modern country where they tie a dog alive, with his jaws shut with a rope, to burn him alive, with a blowtorch! A modern country, where they plunge the puppies alive in oil boiling like a fry! Some customers like fried puppy meat !!! “” it’is very tender “”!! A modern country, where they hang a dog alive, on a hook, with his jaws shut with a rope, to remove his skin! And he is still alive !! Then his bloody body, still alive, is plunged in a boiling water! And when this poor dog tries to get his head out of the water, he is pushed to the bottom with a stick !!! And there …. silence … finally its ordeal has ended !! I’m going to talk to you about this modern country, where they suspend a dog still alive, by his four legs to beat him to death: the meat is tender so-called !!! the country where they hang the dog behind the restaurant !!! And, finally, I will speak to you of this modern country, where, to guarantee the freshness of the meat, they cut the leg of the alive dog, putting him back in the cage for the new demand for a piece of fresh meat! ! I think, you would not even have done it with a chicken !! But them, !!! They do it with the dogs !! A human being, like I am, is deeply chocked by this kind of treatement! I am sick !!! It makes me want to vomit, cry and cry! I can not sleep after seeing some scenes of torture .. why so much suffering inflicted on an animal ?, if this animal is supposed to feed them !! I fight against the suffering and mistreatment that inflicts to the animals !!! Everywhere in the world where I am asked to give my voice for these poor creatures I do it !!! God created us, like the animals on this Earth, the Pope Francis is opposed to all animal mistreatment !! Like many great men in the past !!! When I’ll be in front of the God, I shall not be ashamed, for I know that I had done all that was in my power to stop this animal misery! no animal deserves this treatment !!! !! Neither those who are free, nor those who are our friends and those who feed us , and those who feed us deserve our respect !! you are one of those who do nothing !!! Goodness makes the world and people are beautiful, life is beautiful, everyone laughs and enjoys life! the indifference and monstrosity make people ugly and the world is vile !! Man has transformed the Earth into hell for animals! It’s time to stop it! If you were glad to have written your letter so uinhumaine, I pity your animals, if you have them !! Citizen of St Mard in France and not your friend !! What an amazing reply, how you have worded it, is fantastic. I can’t watch these videos because they stay with me and give me nightmares but I have read what you have written and know the horrific cruelty inflicted on them. How these people that do that can sleep, can exist, is beyond me. We must keep fighting until this is stopped forever. Now that Taiwan has banned it, there is a glimmer of light.